Hence, radius of the circle is 7 cm , i.e., (A). = , i.e. , (B). 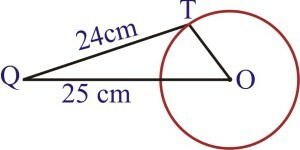 Q.4 Prove that the tangents drawn at the ends of a diameter of a circle are parallel. Sol. 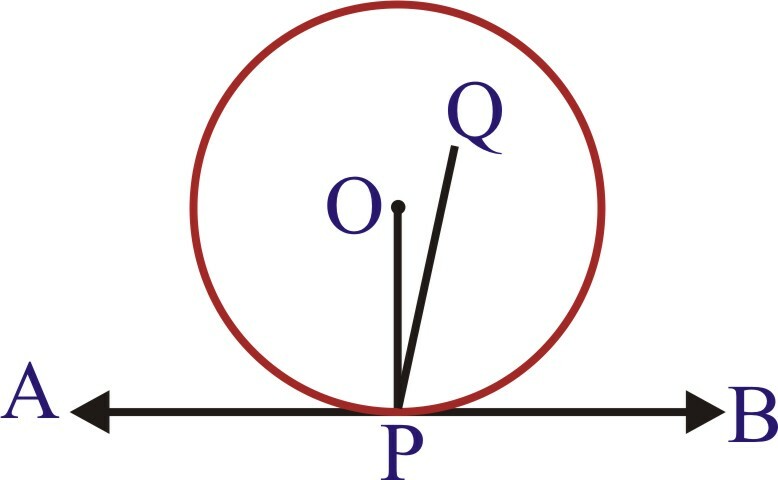 Let PQ be a diameter of the given circle with centre O. 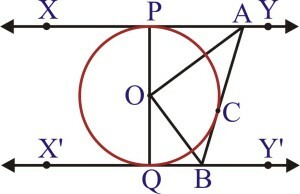 Let AB and CD be the tangents drawn to the circle at the end points of the diameter PQ respectively. 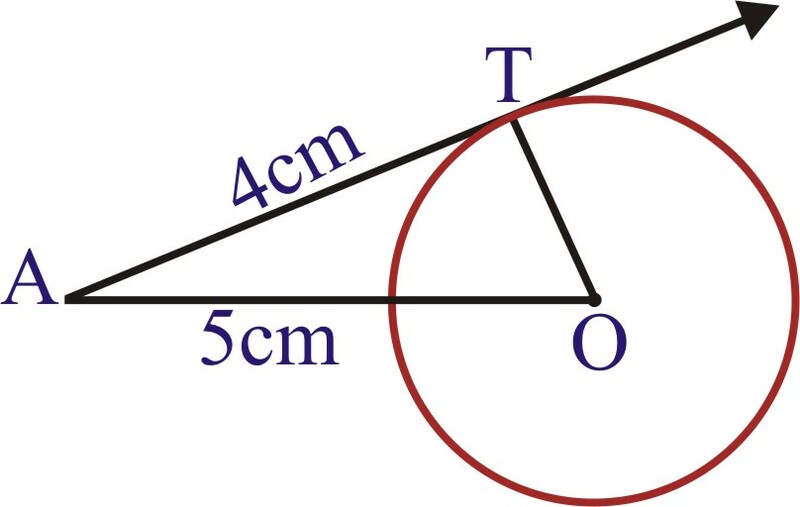 Q.5 Prove that the perpendicular at the point of contact to the tangent to a circle passes through the centre. Sol. 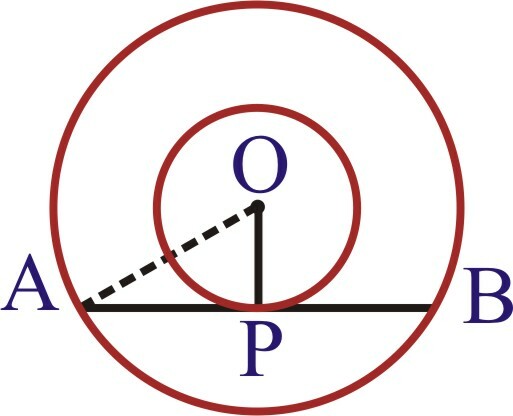 Let AB be the tangent drawn at the point P on the circle with O. If possible, let PQ be perpendicular to AB, not passing through O. Therefore, , which is not possible as a part cannot be equal to whole. Thus, it contradicts our supposition. 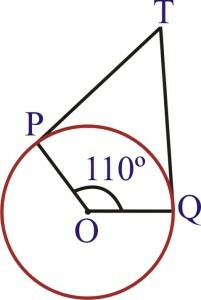 Hence, the perpendicular at the point of contact to the tangent to a circle passes through the centre. 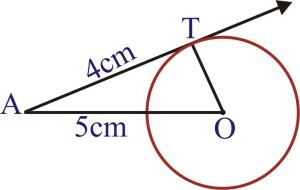 Q.6 The Length of a tangent from a point A at distance 5 cm from the centre of the circle is 4 cm. 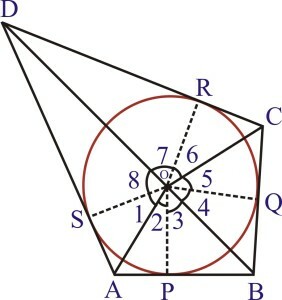 Find the radius of the circle. 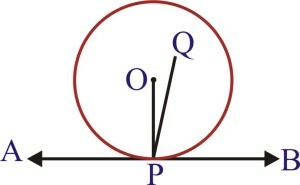 Hence, radius of the circle is 3 cm. 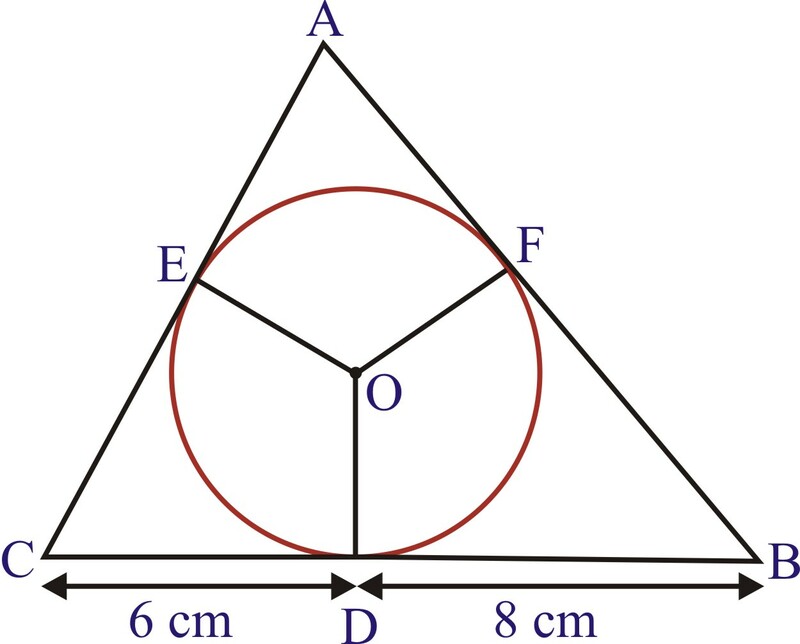 Q.7 Two concentric circles are of radii 5 cm and 3 cm. 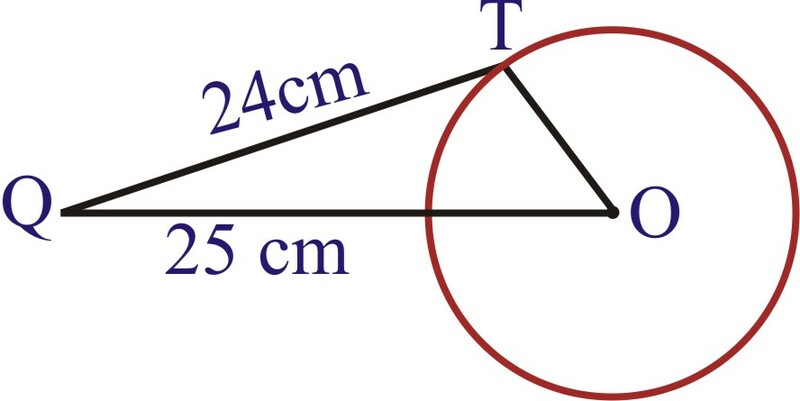 Find the length of the chord of the larger circle which touches the smaller circle. Sol. 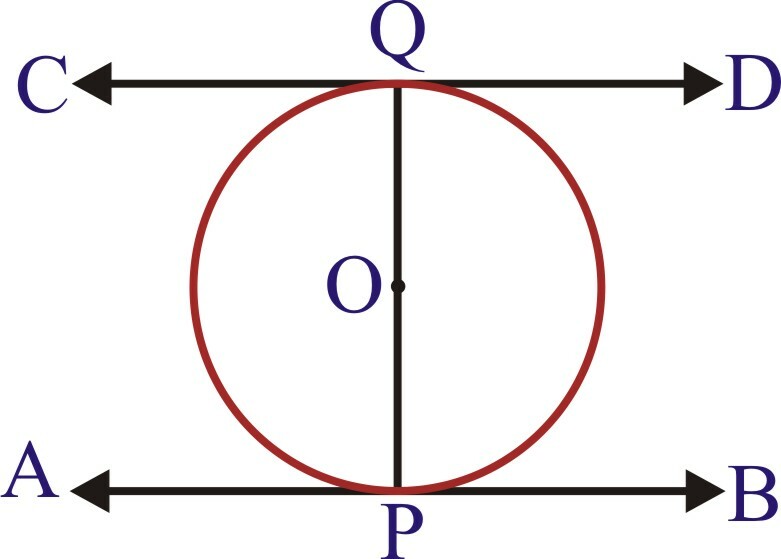 Let O be the common centre of two concentric circles, and let AB be a chord of the larger circle touching the smaller circle at P.
We know that the perpendicular drawn from the centre of a circle to any chord of the circle bisects the chord. So, and AP = BP. Hence, the length of the chord of the larger circle which touches the smaller circle is 8 cm. 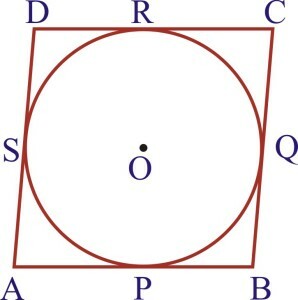 Q.8 A quadrilateral ABCD is drawn to circumscribe a circle (see figure). 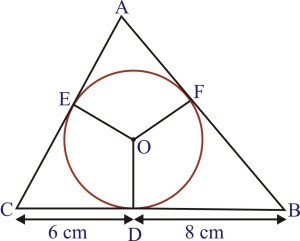 Prove that AB + CD = AD + BC. Sol. 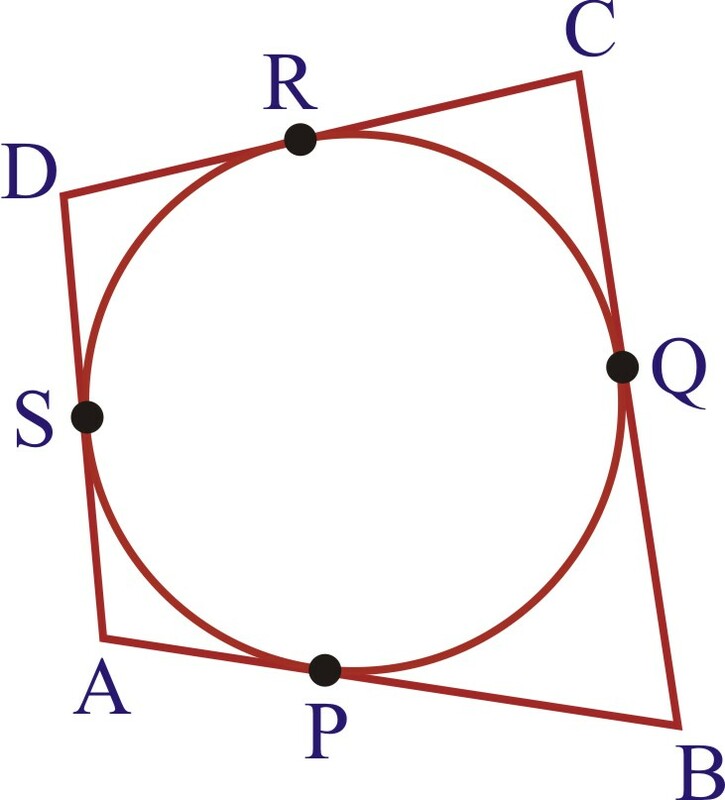 Let the quadrilateral ABCD be drawn to circumscribe a circle as shown in the figure. 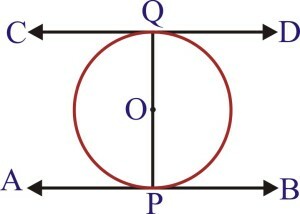 i.e., the circle touches the sides AB, BC, CD and DA at P, Q, R and S respectively. 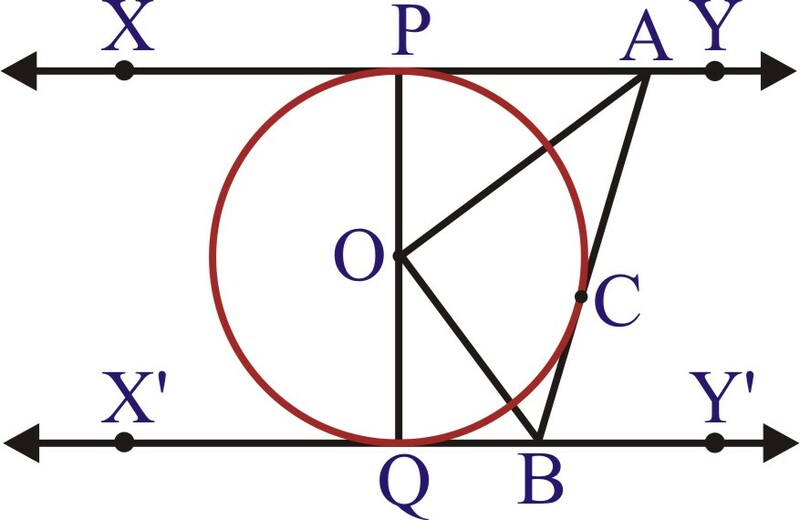 Q.9 In figure, XY and X'Y' are two parallel tangents to a circle with centre O and another tangent AB with point of contact C intersecting XY at A and X'Y' at B.
Q.10 Prove that the angle between the two tangents drawn from an external point to a circle is supplementary to the angle subtended by the line segment joining the points of contact at the centre. 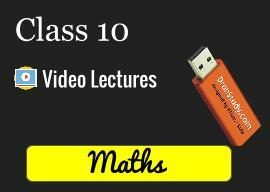 Q.11. Prove that the paralelogram circumscribing a circle is a rhombus. Sol. 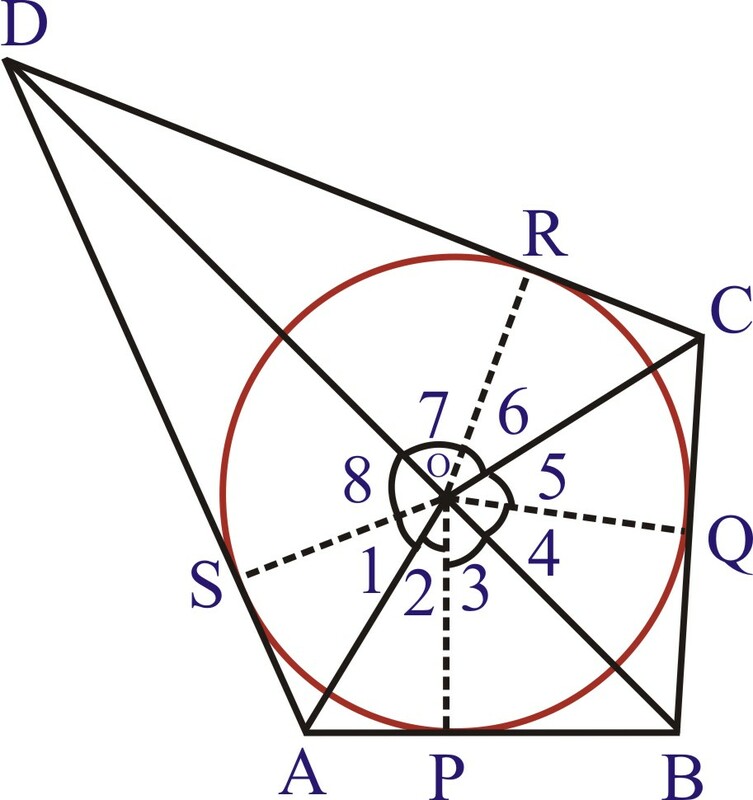 Let ABCD be a parallelogram such that its sides touch a circle with centre O. 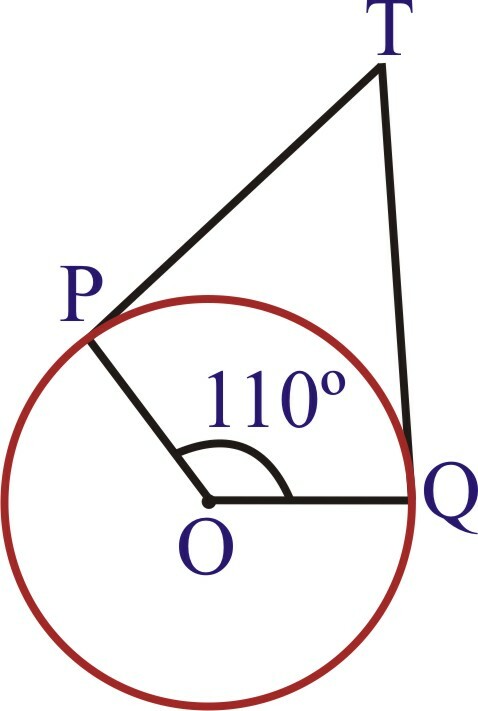 We know that the tangents to a circle from an exterior point are equal in length. 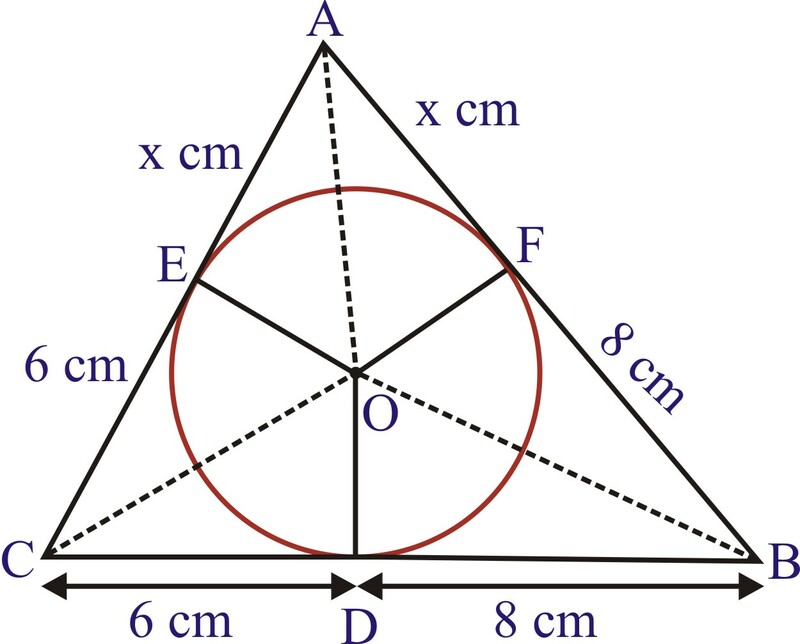 Q.12 A triangle ABC is drawn to circumscribe a circle of radius 4 cm such that the segments BD and DC into which BC is divided by the point of contact D are of lengths 8 cm and 6 cm respectively (see figure). Find the sides AB and AC. Sol. 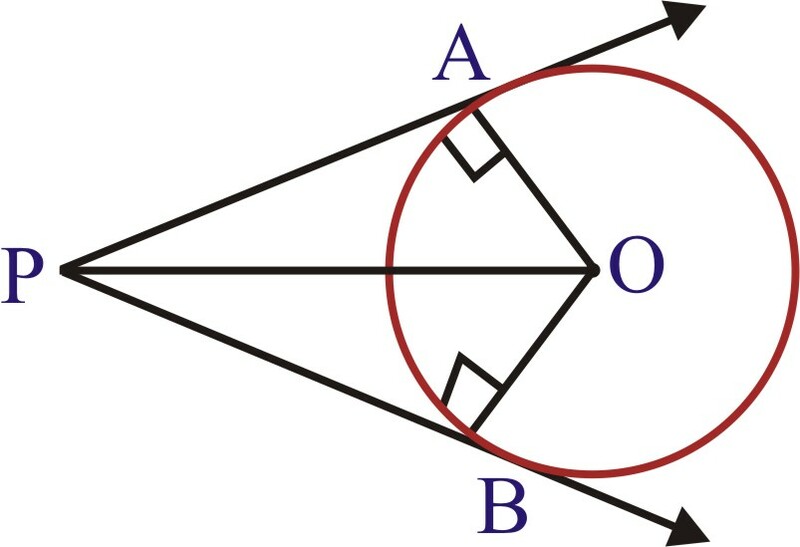 Let the be drawn to circumscribe a circle with centre O and radius 4 cm. 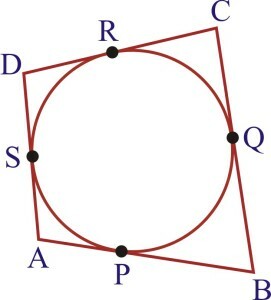 i.e., the circle touches the sides BC, CA and AB at D, E and F respectively. 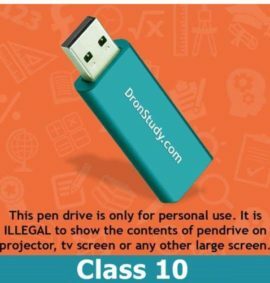 It is given that BD = 8cm, CD = 6 cm. Since, lengths of two tangents drawn from an external point of circle are equal. and let AF = AE = x cm. 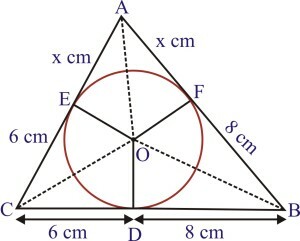 Then, the sides of the triangle are 14 cm, (x+6) cm and (x+8) cm. 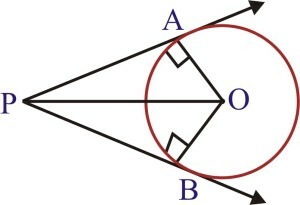 Hence, the sides AB and AC are 15 cm and 13 cm respectively. Q.13 Prove that opposite sides of a quadrilateral circumscribing a circle subtend supplementary angles at the centre of the circle. Sol. 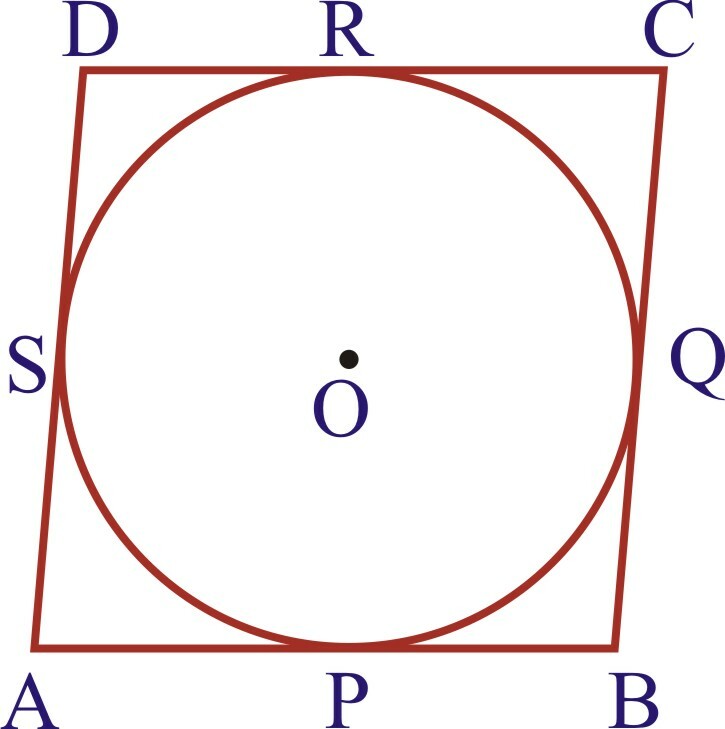 Let a circle with centre O touch the sides AB, BC, CD and DA of a quadrilateral ABCD at the points P, Q, R and s respectively. 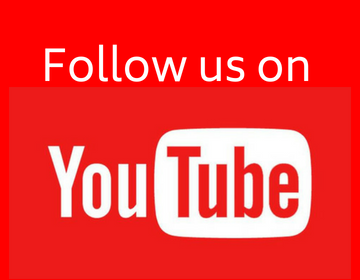 Join OP, OQ, OR and OS. 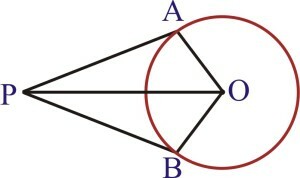 Since, the two tangents drawn from an external point to a circle subtend equal angles at the centre.